Bucks welcomed a new addition to its pub-restaurant offering recently when the huge new Beech House opened in Amersham. CLICK THE LINK ABOVE OR THE ICON IN THE MAIN IMAGE TO SEE A GALLERY TOUR OF BEECH HOUSE AMERSHAM. Growing up in Aylesbury in the 80s and 90s there wasn’t too much going on and when we were of an age my friends and I would often jump on the Chiltern line train and head to Amersham which had a great swimming pool, a Porsche garage and a superb little kebab and fish and chip shop. There was something cool about Amersham and we’d ogle at the Porsches dreaming of one day driving one around while we ate our fish and chips. Only one of us managed that dream of driving a Porsche - and it wasn’t me - but now, 20 years on I’m finally sat in the showroom but not as we knew it, instead ready to eat and drink in the wonderfully and innovatively designed Beech House which ensures Amersham retains that sense of cool. As I sat down to eat on the mezzanine floor, I was fascinated to hear this was the old car park while dozens of people packed out the buzzing bar area which used to be the fish and chip and kebab shops. Beech House is one of the biggest restaurants in Bucks seating over 140 but it does not feel cramped or overcrowded in any way, shape or form despite its obvious popularity. It boasts one of the best dining atmospheres I’ve experienced and manager James Stanton might have his hands full but runs a well oiled ship. The bar is as popular as the restaurant and looks to be yet another success story for the ever expanding Oakman Inns group, born out of nearby Tring in Hertfordshire. Oakman is bucking the national trend of pubs and restaurants closing and it’s easy to see why, entrepreneur Peter Borg-Neal is surely one of the most astute restaurateurs in the business at the moment with real vision... I mean who would have seen an old car garage and two takeaway restaurants as the opportunity to create this? Thankfully the food matches the overall experience with a wide range of choice and great service. Oakman is committed to its venues being not only great destinations for customers but also great places to work, regularly being recognised for top honours in the employment industry. It is also committed to the environment as initiatives like ditching plastic straws and more recently a pledge to eradicate single use plastics exemplify. The menu offers a wide range from daily specials such as the delicious chicken liver parfait to Oakman classics such as the Saltimbocca scotch egg, 15 hour slow roasted pork belly - my mouth is watering just writing that - and staples such as fish and chips. A special mention must go to the seafood linguine which is a must and also the vegan menu which ensures all tastes and requirements are catered for with the likes of cauliflower steak, beetroot falafel burger putting an end to bland, unimaginative dishes for those who are that way inclined. The chefs are on full display cooking up your food in the open kitchen, a feature of Oakman restaurants which I feel adds a great deal to the overall atmosphere and experience. The stars of the dessert menu are the passion fruit and lemon curd meringue mess and white chocolate cheesecake but the British cheese plate is also fantastic for those who prefer a more savoury final course. The wine list offers almost too much choice while the cocktail menu is fun and features a bit of everything from the Mojito to Passiontini while the beer is delivered under pressure into the huge vats from the Greenwich brewery. Staff are attentive and on the ball - as you would expect for a restaurant that has only been open for just over a month - but not overly intrusive. Those familiar with Oakman’s other Beech House over in Beaconsfield will know what to expect at its new Amersham venue but everything is on a grander scale. There is off road parking close by and the multi-storey car park is in easy walking distance as is the train station. Oakman really is onto something with its formula and as a local operation we should be proud of what it is doing for a flagging industry. Beech House is another example that the demand IS there IF you get things right and there is a fine balance between operating a successful restaurant and popular bar. It seems James and his staff have found it already and long may it continue. 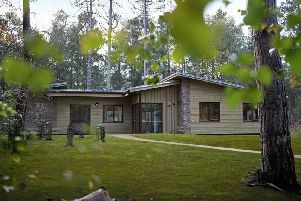 If you are looking for somewhere new to try this summer you won’t go far wrong with Beech House.